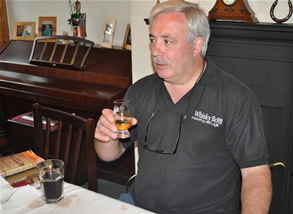 Wednesday night June 16th 2010 and it is only Jim and Dougie at the tasting table tonight, and as we both love Islay malts this is one that we were both eagerly looking forward to. Built in 1846, Caol Ila is the largest of the Islay distilleries. 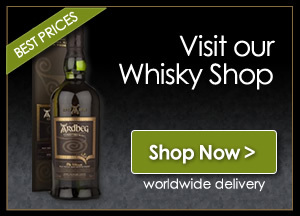 With the majority of it’s production going for blending, but it’s single malts are fabulous. 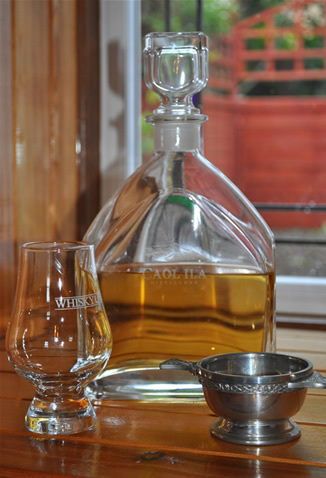 On this occasion there was no bottle to open, Jim has a decanter which he purchased many years ago at the Caol Ila Distillery and ever since then this decanter has only ever held this grand Islay Malt . Nose…I have arrived at the seashore and the BBQ is in full swing. Taste…Citrus smokey peatiness and it is sweet,medicinal and the seaweed is not going away. Finish…Long and smokey with a slight peppery finish. Nose…Fresh ebb tide, rock pools and toasted seaweed. Taste…Smooth hot smoke and malt which totally coats the taste buds with an underlying oily sweetness. Well well well did we like this one or did we like this one. Once again an Islay malt that delivers on every level, you will be able to get a bottle of this 12 Year Old in some of the supermarkets and certainly online and at your specialist Whisky Shops. If you enjoy your Whisky then this one is one for your cabinet, Jim’s decanter which is maybe 6/7 years old has never been empty, always containing a Caol Ila, if it appears to be going down (by the way this is Jim’s wife’s favourite Islay, and this is not an accusation to why the level is going down) then a bottle is purchased and the decanter topped up.